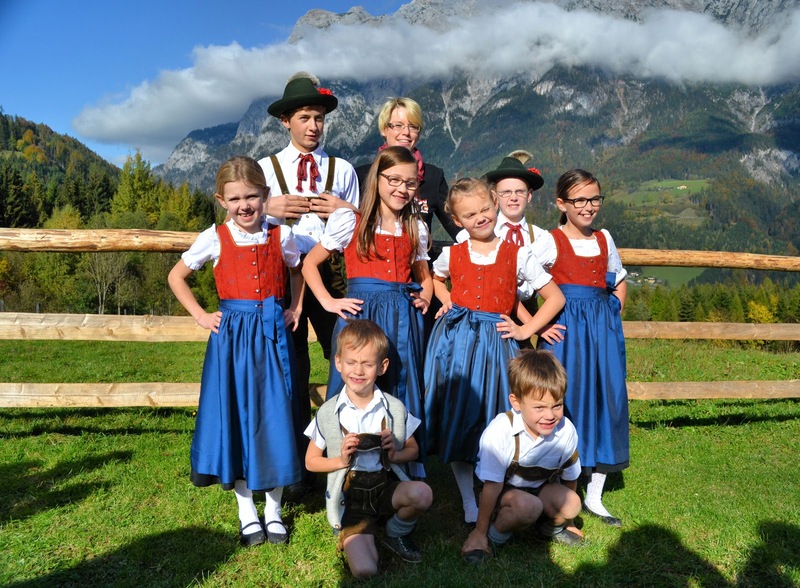 Welcome to the Sound of Music Tour in Salzburgerland, Austria. All photography unless otherwise noted, is the property of EuroTravelogue.com™. Unauthorized use in all instances is prohibited. 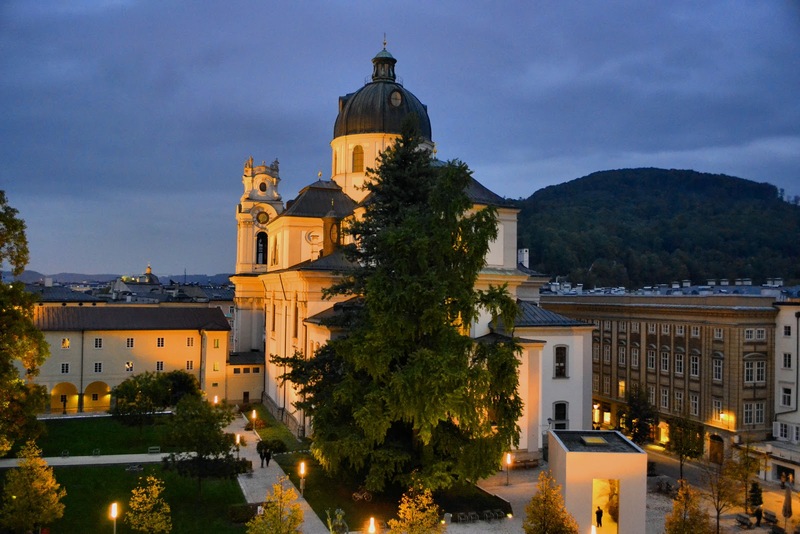 It was an early start as we boarded the bus and embarked on our Sound of Music tour that would take us to all the sights made famous by the film. 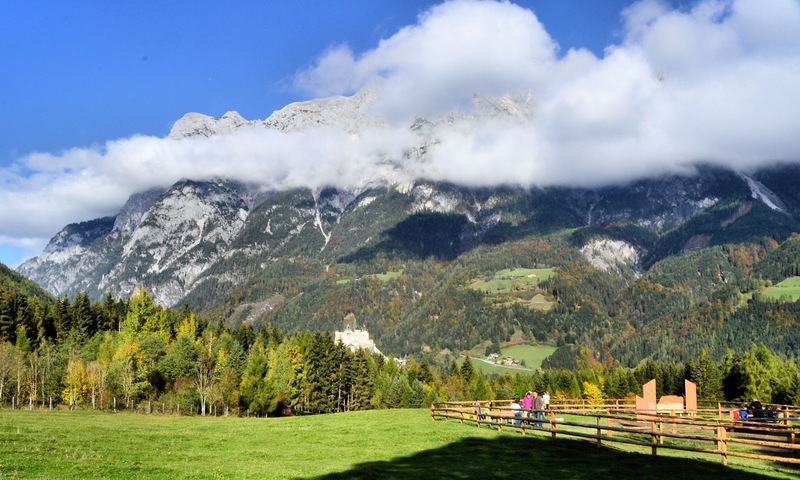 We started in Salzburg city centre and then set out to Salzburgerland for a wondrous journey through the splendid Alpine region surrounding the city of Mozart, festivals and of course, "The Sound of Music." Our guide for the day, Michaela, introduced herself and her very special guest too—Elisabeth von Trapp, granddaughter of the renowned Maria and Baron Georg von Trapp. After Elisabeth greeted all of us, she began to gently strum the notes of "Edelweiss." The din of the bus fell silent as her sweet voice filled the air with the beloved Austrian ballad. 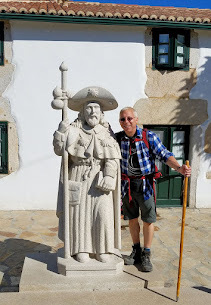 From that moment, I knew this day was going to be filled with sights and song as we set out on our pilgrimage of sorts to relive the legendary story of "The Sound of Music." But we're not the only ones. Salzburg, Austria, as seen from the Hohensalzburg Fortress. Click on any photo to enlarge. 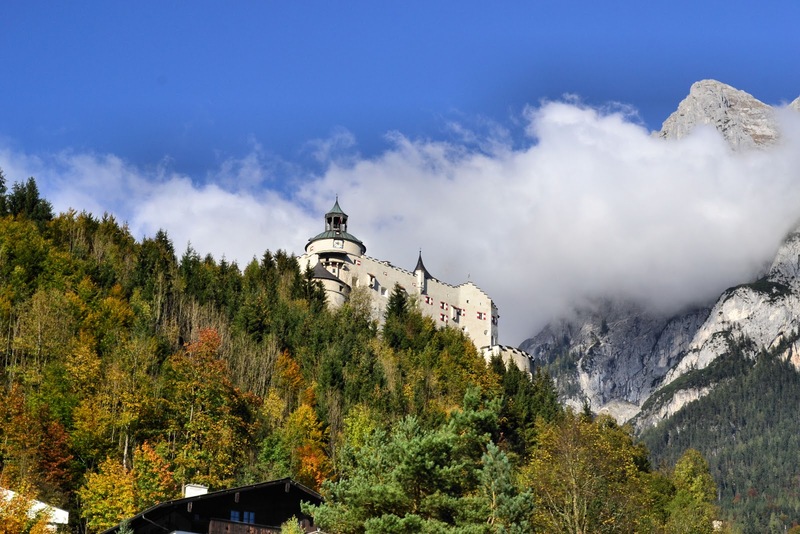 Ever since its debut in 1965, "The Sound of Music" has driven 300,000 fans every year to Salzburg, Austria, to visit the famous sights and to relive those unforgettable moments that we all cherish and hold dear. Like all those who have come before and will continue after I am gone, I set out on a similar journey and chronicled every step of the way. Join me as we explore iconic landmarks, scenic Alpine meadows and even meet some of the original cast of kids too! Leopoldskron Palace dates back to 1736. 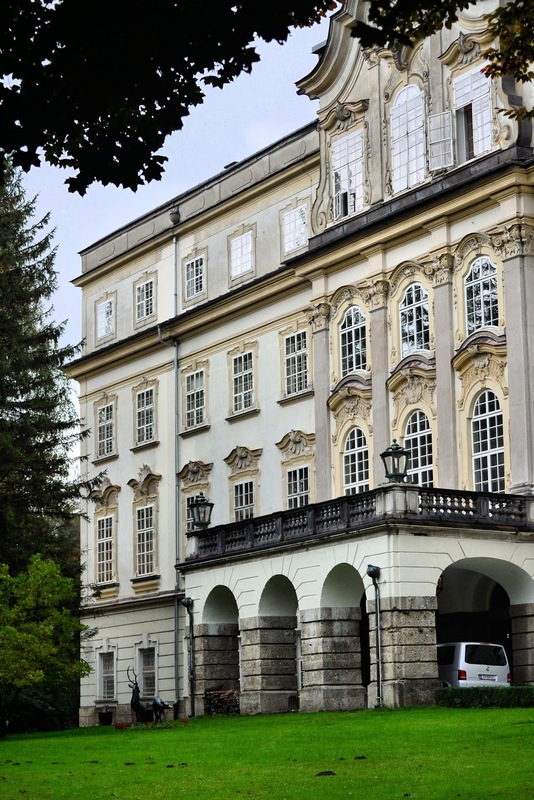 Actually, our tour began the day prior at a morning press conference at the Leopoldskron Palace, just outside the Salzburg city centre. Commissioned by the Prince of Salzburg, Leopold Anton Freiherr von Firmian, the palace opened in 1736 as a family estate and today, it's a sumptuous hotel with 55 rooms located in the adjacent Meierhof building, 12 elegantly appointed suites in the original palace and two spacious townhomes for your home-away-from-home accommodations. 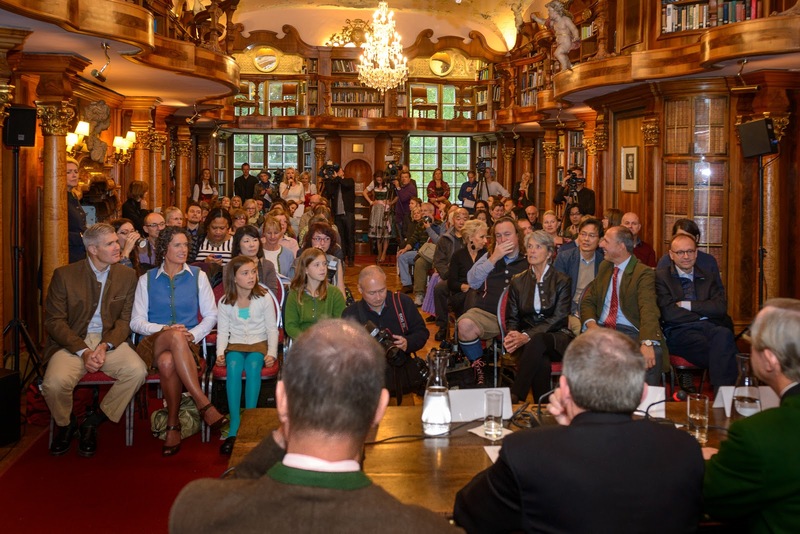 Press conference in the library at the Leopoldskron Castle in Salzburg, Austria. Do you see me? Photo: © Tourismus-Salzburg GmbH. Unauthorized use is prohibited. The conference was held in the palace's library—a room lavishly decorated in richly carved woods, ornamental pilasters and hundreds of volumes enclosed in beautifully crafted bookcases. The room itself was a work of art! In attendance were four of the original cast of the Von Trapp children: Friedrich, Nicholas Hammond; Louisa, Heather Menzies; Kurt, Duane Chase; and Marta, Debbie Turner; plus, the legendary Johannes von Trapp, the youngest of Maria and Georg's ten children. He was joined by his wife, daughter and grandchildren. And finally, Salzburg Governor Wilfried Haslauer and Mayor Heinz Schaden joined the group as well to enlighten us on the impact that the Sound of Music has made to Salzburg and the surrounding Salzburgerland region. 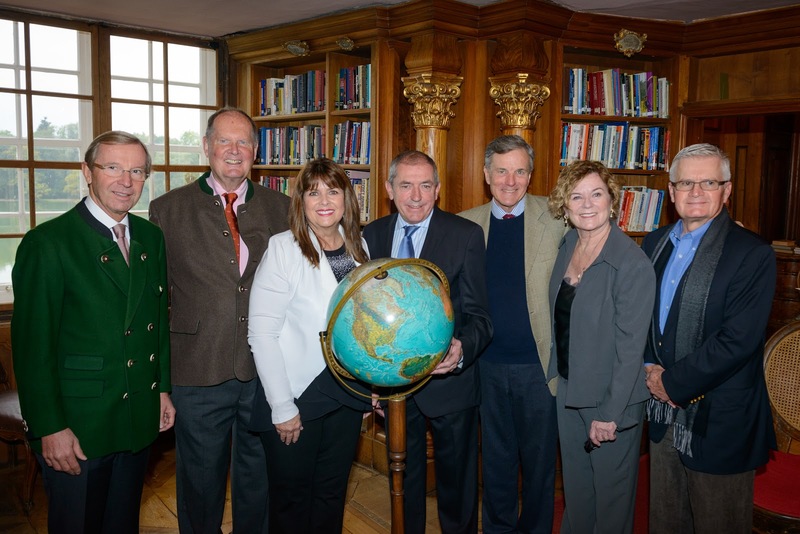 L to R: Salzburg Governor Wilfried Haslauer, Johannes von Trapp, Debbie Turner, Salzburg Mayor Heinz Schaden, Nicholas Hammond, Heather Menzies and Duane Chase. 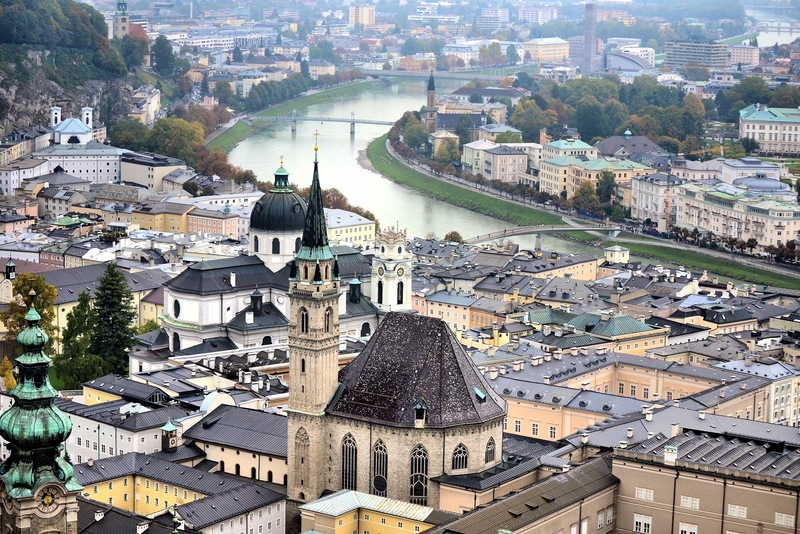 Photo: © Tourismus-Salzburg GmbH. Photographer G. Breitegger. Unauthorized use is prohibited. During the conference, I asked Nicholas Hammond (Friedrich) what the most magical memory he had from filming the movie. "Undoubtedly, the rowboat scene when we all fell out of the boat," he regaled our group. 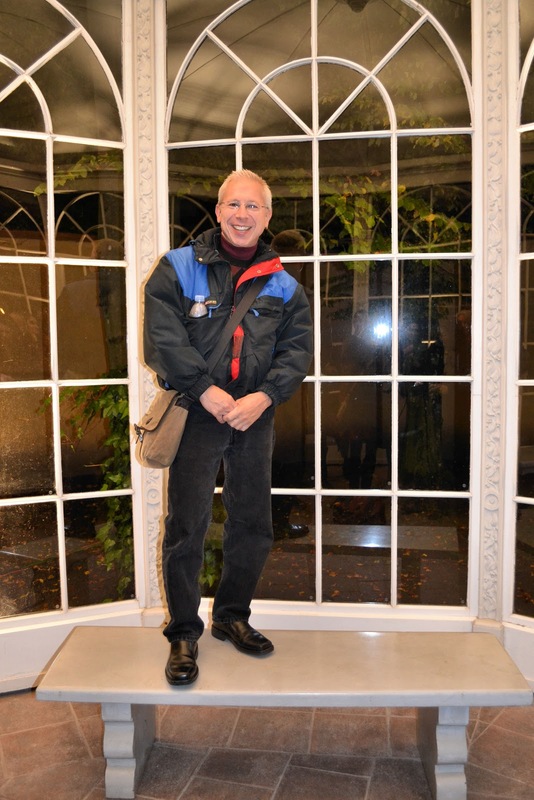 He also mentioned that the introduction to Salzburg and the surrounding region was another highlight. How uncanny that he mentioned the rowboat scene because that scene was actually filmed in the backyard of the Leopoldskron Palace. Just beyond those gates, Maria and Von Trapp kids tipped the canoe and fell into the water. One of Nicholas Hammond's most cherished memories from "The Sound of Music" production. The palace also served as inspiration for the ballroom scenes in the movie. The opulent Venetian Room on the first floor of Leopoldskron was painstakingly replicated down to the finest detail and built on the sound stage at Twentieth Century Fox, they didn't want to change a thing. 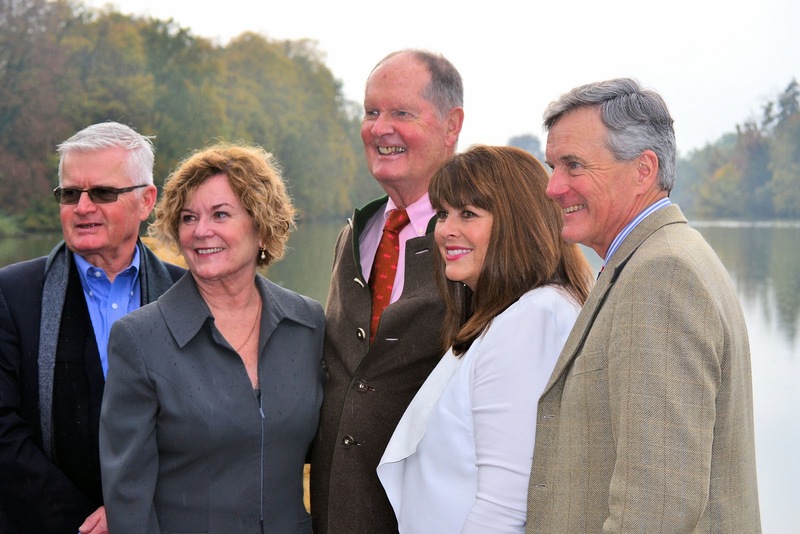 Reliving the rowboat scene at the Leopoldskron Palace with Duane Chase, Heather Menzies, Johannes von Trapp, Debbie Turner and Nicholas Hammond. The Hellbrunn Palace in Salzburg, Austria. Photo: © Tourismus-Salzburg GmbH. Later that evening, it was dinner at the Hellbrunn Palace. Once we walked through the palace gates, there it was, like a beacon glowing in the black of the night, the gazebo where Liesl and Rolf performed "Sixteen Going on Seventeen" and where the Baron and Maria sang "Something Good." Although its present location is at the Hellbrunn Palace, the scene was actually filmed in the gazebo's original location at the Leopoldskron Palace. During post production, Twentieth Century Fox donated it to the city of Salzburg who later moved it to the Hellbrunn. 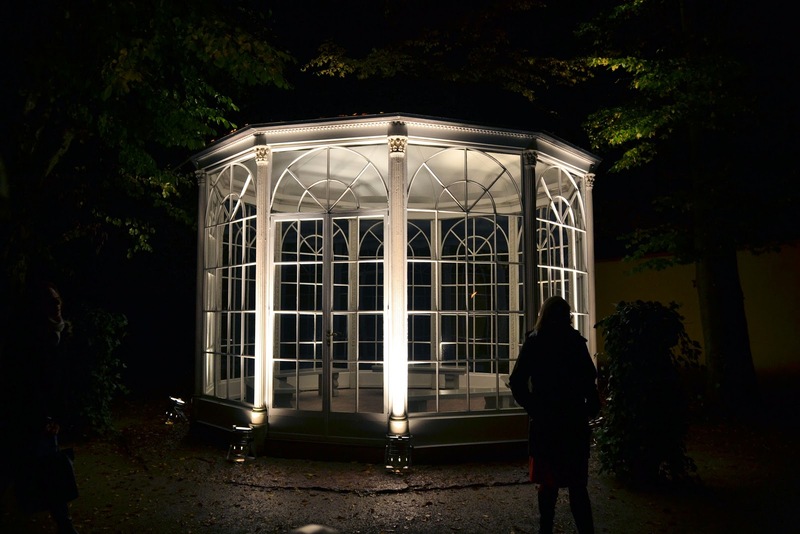 "The Sound of Music" gazebo, now at the Hellbrunn Palace, was originally located at the Leopoldskron Palace during film production. 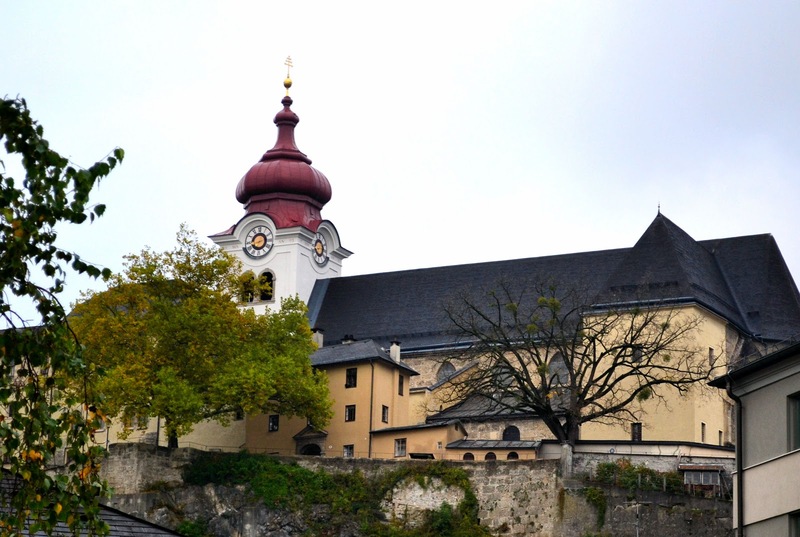 Although the Nonnberg Abbey is closed to the public, you can still visit the adjacent Gothic church on your way down from Hohensalzburg Fortress. Our next stop was the Nonnberg Abbey where a young 19-year-old novice, Maria Augusta von Kutschera, began her studies back in 1924. Two years later, Fräulein Maria became the Von Trapp family governess and in 1927, she and Georg von Trapp were married in the abbey's church. But the history stretches much farther than that—back to 713 when the nunnery was established. Today, it is still considered to be the oldest in the world in continuous operation and currently, 24 nuns are cloistered with no access to the outside world. 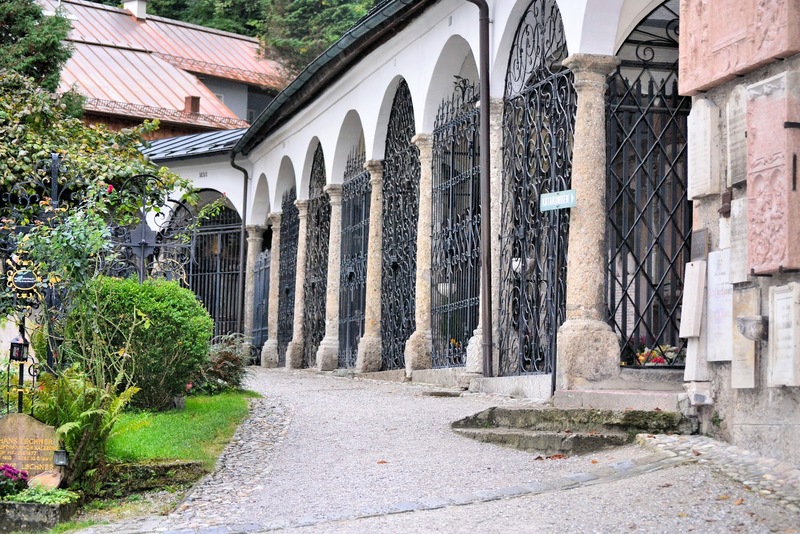 In the photo above, you can see the entrance gates where the kids called on Maria after she had left the Trapp villa. Look closely beneath and to the right of the red dome and you'll see the pediment above the gated doorway. Although the abbey is not open to the public, you can still visit the adjacent Gothic church on your walk down from the Hohensalzburg Fortress, about half way down along your descent. The front and rear facades of the Frohnburg Castle were used to film the exterior shots of Trapp villa in the film. Although our schedule did not permit a visit to the privately-owned Schloss Frohnburg Castle, we did see it in passing. 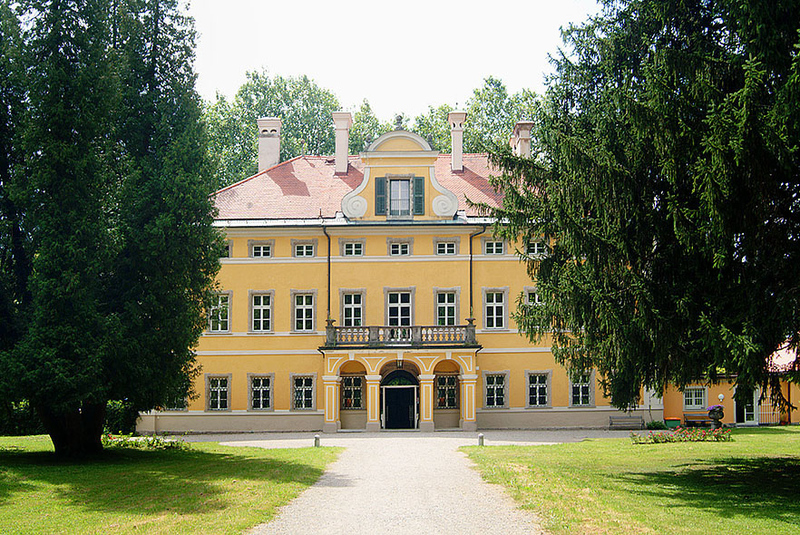 All of the exterior shots of the Villa Trapp in the movie were shot at Frohnburg. Perhaps you may recall these scenes from the film: all front façade shots including the scene when Baron von Trapp pulls down the Nazi flag; the colonnade of trees leading to the castle provided the backdrop for Maria as she skipped through singing "Confidence"; and finally the rear exterior was used when Rolf threw rocks at Liesl's window. Beyond the Hohensalzburg Fortress, behold Untersberg Mountain, the location of the final scene in the movie when the Von Trapps were crossing over the mountains into Switzerland. © Tourismus-Salzburg GmbH. Up ahead in the distance, Untersberg Mountain climbs high into the sky and it is on the mountain where the closing scene of the movie was filmed. In the script, the Von Trapps were heading into Switzerland over this pass however, had they really traversed its peaks, they would have ended up at the Eagle's Nest, one of Hitler's headquarters and holiday retreats. Today, there is a cable car that will take you up to the most spectacular views of Salzburg and Salzburgerland. Home to the original Von Trapp family villa, Aigen was the town where the family started their bed and breakfast prior to their escape from the Nazis. When they finally did leave, the route they took was not from Austria to Switzerland on foot, but to Italy, Switzerland and then to London by train. They boarded a ship for America and arrived in 1939. Two years later, they settled in Stowe, Vermont, and in 1942, they purchased a farm which later became the Trapp Family Lodge; one of today's most renowned and premium resort destinations in Vermont. With an hour until our next stop, I had a chance to sit back and enjoy the beautiful scenery of Salzburgerland. I quickly settled in with my journal and caught up with my entries about the trip thus far. As we began our ascent to Austria's mountain and lake district, the movie soundtrack played. Suddenly a chorus of sweet melodies resounded from the back of the bus—lovely voices singing along to "The Sound of Music" soundtrack. I was enchanted. Lake Wolfgang was used in the film's opening shots of the Austrian countryside. Before reaching Mondsee or Moon Lake, the location where the bicycling scene was filmed as well as the magnificent wedding scene, we stopped by Lake Wolfgang which was featured in the opening scenes of the movie. We stepped out for some pictures of this beautiful lake, surrounding valley, and of the sun, something we haven't seen in days. When I hopped out of the bus for one more parting shot, the doors closed suddenly and panic ripped through my body. Quickly I ran to the front and waved my arms frantically. I don't even want to think about what would have happened had they not seen me. Luckily smiles and a few chuckles greeted me, thank goodness not sneers. Soon thereafter, we were on our way so I sat back in my chair and continued writing. 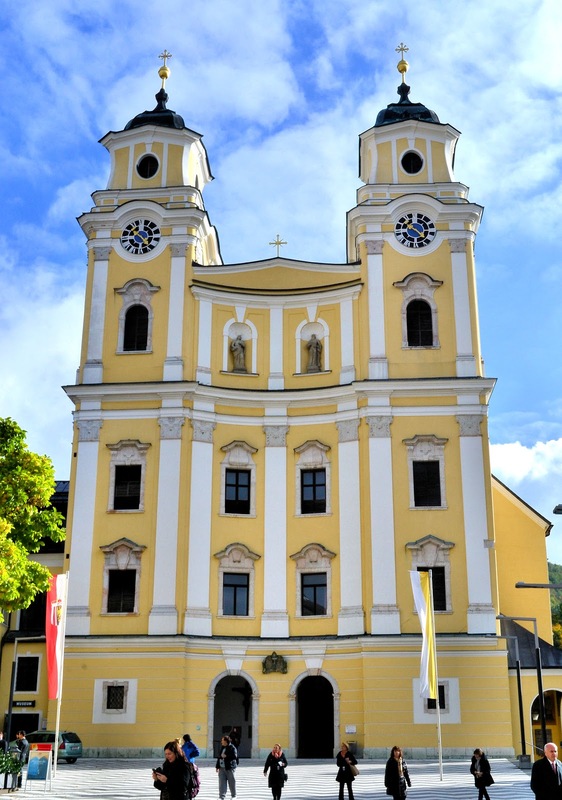 Saint Michael Church in Mondsee, Austria, was the location for the wedding scene in "The Sound of Music." 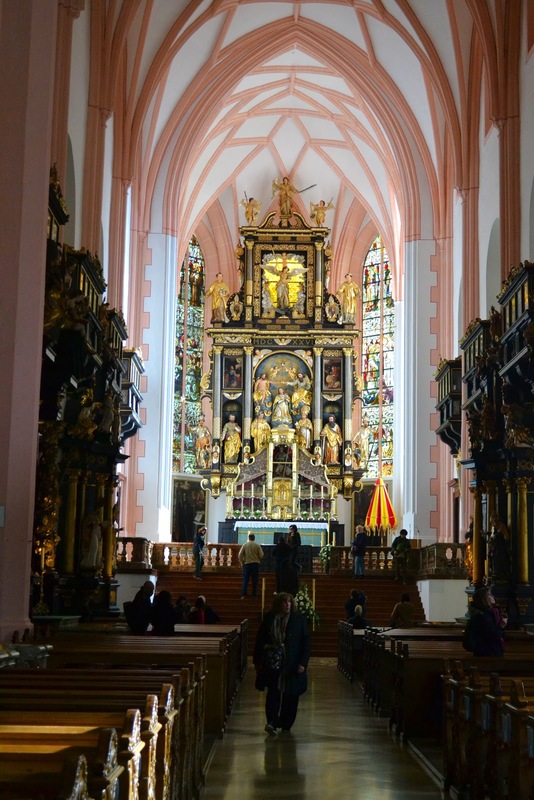 As I entered Saint Michael Church in Mondsee, I imagined the entire wedding scene unfolding as I walked down the nave. Suddenly, scenes of Maria on her way to the altar with her bridal train trailing behind played out in my head. As I proceeded to the high altar created by Hans Waldburger in 1626, I paused for a moment at the St. Joseph's altar on the right where Maria bade farewell to her sisters of the abbey. Saint Michael Church in Mondsee, Austria. What surprised me most about Saint Michael Church was its Gothic origins that belie its Baroque façade—soaring vaults, stained-glass windows, and a history that dates back to 1104 when an earlier church was consecrated. Traces of this predecessor were only recently discovered in 1972-1982. Ensuing reconstructions began in the 15th century and continued to the Baroque façade completed in 1737. Spires were renewed in 1774 and the north tower had to be completely reconstructed in 1963 after it fell into such disrepair. 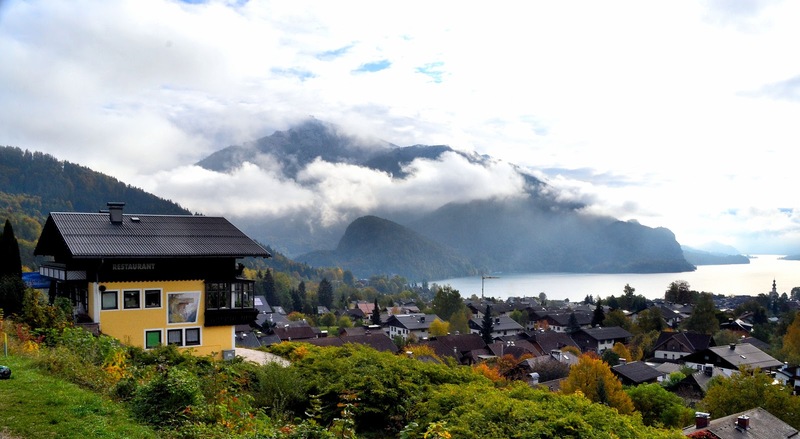 Today, it is a glorious testament and a time capsule of the last 1,000 years in Mondsee. Look closely at the extraordinary collection of relics in the High Altar at Saint Michael's. 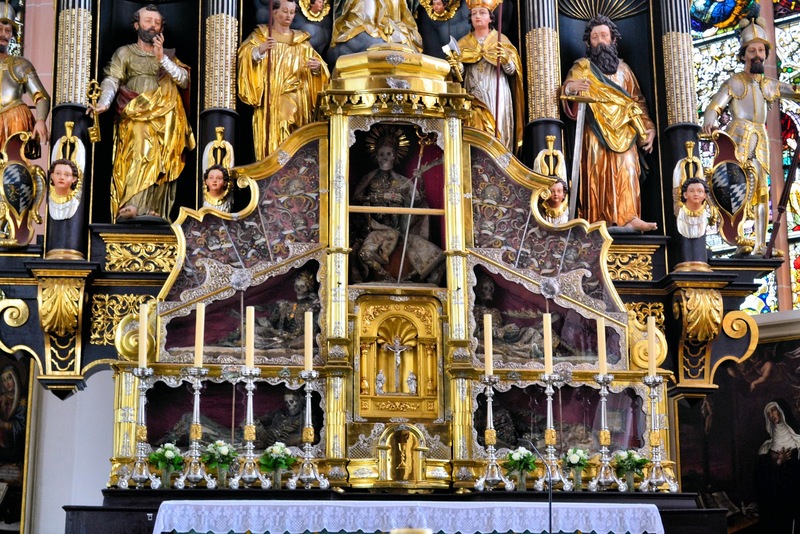 Before we leave Saint Michael's, I need to mention the exquisitely ornate High Altar and its extraordinary collection of saintly relics including: a fully seated skeleton of Abbot Konrad II whose bones were forced into that position in Passau, Germany; four reclining saints, two on each side of the Abbot; and at the top, relics from 40 martyrs. 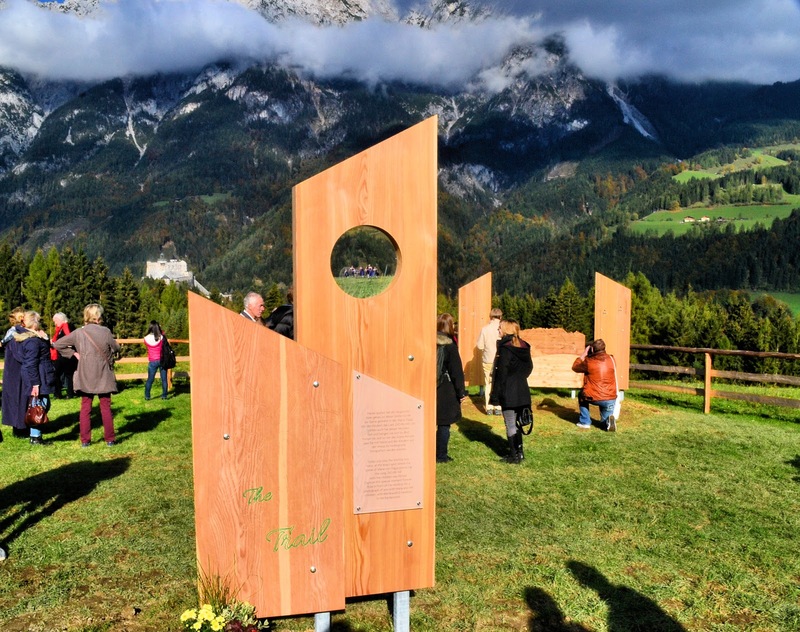 The Gschwandtanger Meadow is the last stop on the Sound of Music Trail in Werfen, Austria. 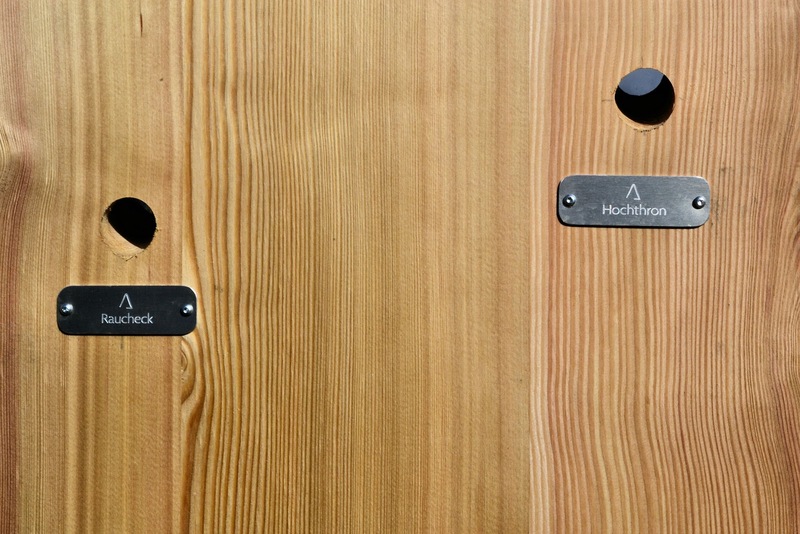 The signage at the right is actually a map of the surrounding peaks and flanking each side are cleverly designed panels with little windows allowing you to take a peek of a peak in the background. 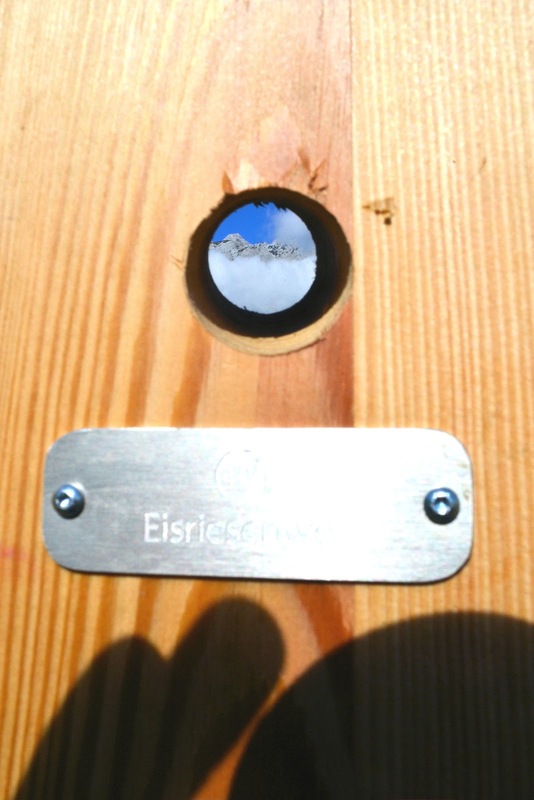 Each peak hole identifies the mountain beyond. After a scrumptious lunch at Obauer in Werfen with wine pairings from the Von Trapp Wine collection by Weingut Höpler - exclusive purveyor to the Trapp Family Lodge in Stowe, Vermont; we made our way up the hills to the brand new Sound of Music Trail which was due to open the following day October 18, 2015. Undoubtedly, this was one of my favorite stops in our day-tour through Salzburgerland! Close-up view of Hohenwerfen, the castle seen in the background of the Gschwandtanger Meadow. 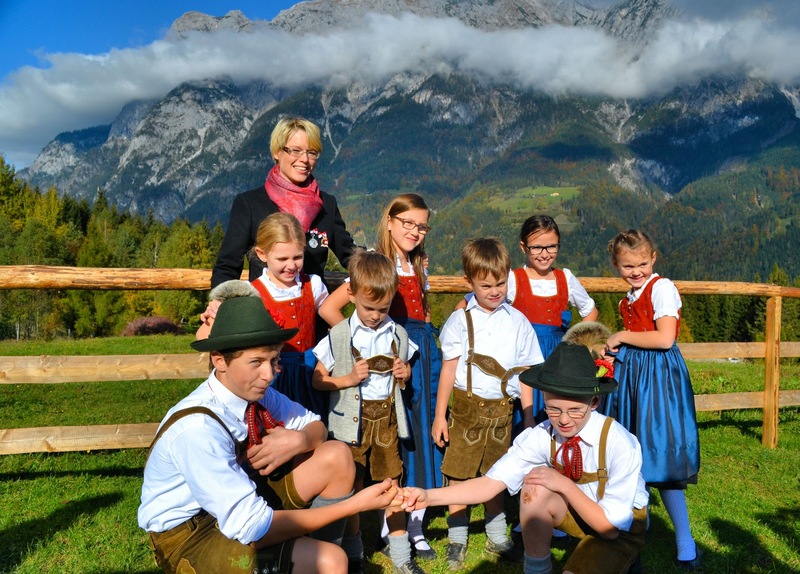 The Sound of Music Trail allows you to retrace the story of the Von Trapp family's journey amid the beautiful countryside of Salzburg. 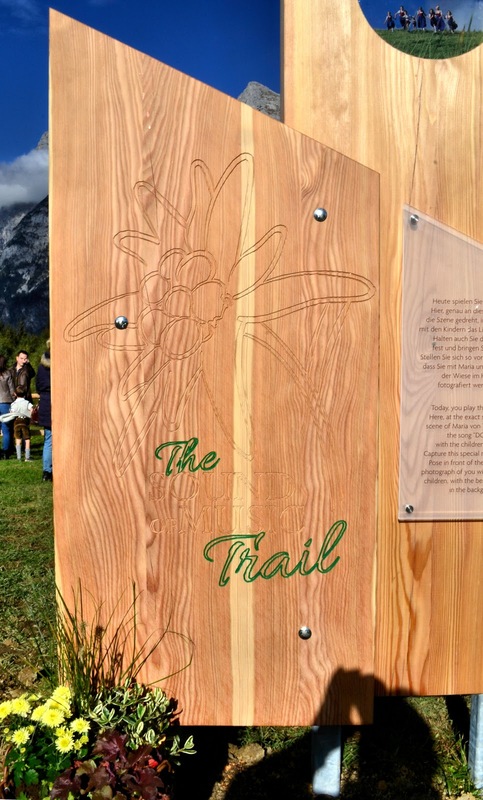 The trail is only 1.34 km in length and takes about an hour to hike from the beginning (entrance located next to the tourist office), to its culmination point at the Gschwandtanger Meadow. Along the way, you'll stop at six stations, each offering a fun, interactive experience including magic cubes and music rolls to keep you humming along your ascent. The best part of the Sound of Music Trail is that it's family-friendly so kids of ALL ages can climb every mountain! And, it's free! At the trail's end, you'll immediately recognize the Gschwandtanger meadow as the location of the picnic scene when Maria teaches the kids "Do-Re-Mi." If you look carefully in the photo below, you'll find Hohenwerfen Castle perched upon a peak in the background. Cleverly designed welcome signs with maps and legends greet you at this final stop on the Sound of Music Trail—Gschwandtanger Meadow. 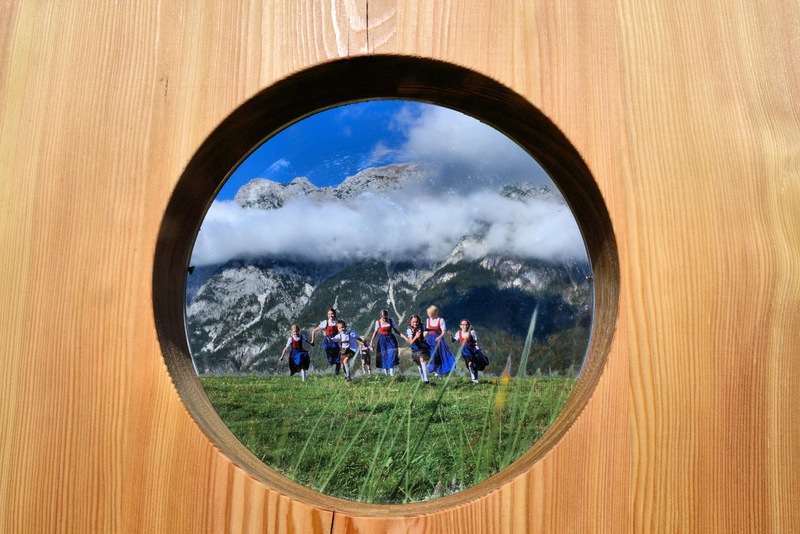 Sound of Music comes to life in the Gschwandtanger meadow. As I stood there in the Gschwandtanger meadow, I was in awe of the surrounding mountain majesty—soaring peaks and verdant pastures stretching as far as the eye could see under clear blue skies and sunshine—is all of this real? Overwhelmed, I honestly couldn't believe my eyes! As if this moment weren't perfect enough, my eyes caught sight of a strangely familiar woman dressed in a traditional dirndl and dancing with eight Austrian children of various ages also dressed in traditional costume. It was as if I were there with Maria and the Von Trapp kids learning "Do-Re-Mi." Captivated, I fell under their spell and reveled in this enchanting moment for as long as I could. The hills are alive with the sights and sounds of music. 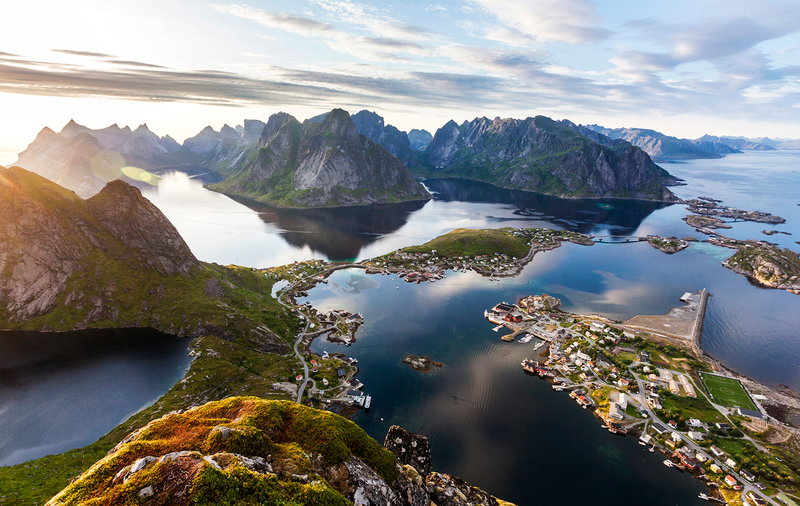 Artful maps and legends guide you as you explore the surrounding landscape. This clever sign welcomes you to the Sound of Music Trail. Look carefully and you'll see that the bottom half of this circular window (figures and grass in foreground) is actually a painting while the top half allows you to view the stunning background through clear glass. Artful maps and legends help you to identify elements in the surrounding landscape. From "peek to peak" ... Take a peek at a peak with this cleverly designed map and legend which help you explore the surrounding Alpine mountainscapes. Another peek at the peaks. Close-up view of one of the peak holes. Dusk descends upon Salzburg, Austria, just before the "The Sound of Music" Gala! Following my euphoric ascent up the Sound of Music Trail, we made our way back to Salzburg city centre with just enough time to get ready for the ball—the Sound of Music Gala at the Summer Riding School in Old Town. We arrived for a short reception on a private terrace adjacent to the Summer Riding School where the gala will take place. Met some wonderful new friends as well. Met some wonderful new friends including Nicholas Hammond aka Friedrich at the reception before the Sound of Music Gala in Salzburg, Austria. During the opening score, a candlelight procession of 50 nuns filled all three tiers of arcades. The grand finale of my "Sound of Music" pilgrimage as well as that of the yearlong 50th Anniversary celebration culminated at the Felsenreitschule (Summer Riding School) in the Salzburg Old Town centre. As all Sound of Music fans know, the Summer Riding School was where the Von Trapps performed their last songs in Austria before escaping to Switzerland. Our host for the evening performance was none other than Uwe Kröger, an Austrian legend of the stage. 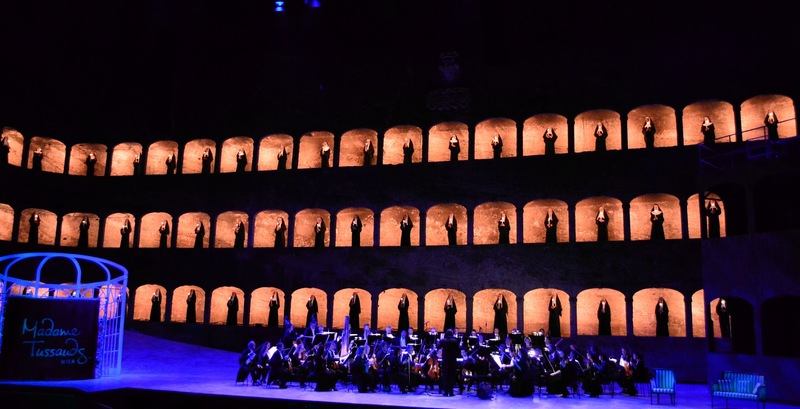 The gala opened with the Mozarteum Orchestra performing the opening score while a candlelight procession of 50 nuns filled the three tiers of arcades in the background. Maria, played by Milica Jovanovic, then performed a beautiful rendition of "The Sound of Music" (The Hills are Alive). Following were many favorite songs and memorable sequences from the movie. Julie Andrews is about to take center stage at Madam Tussauds. 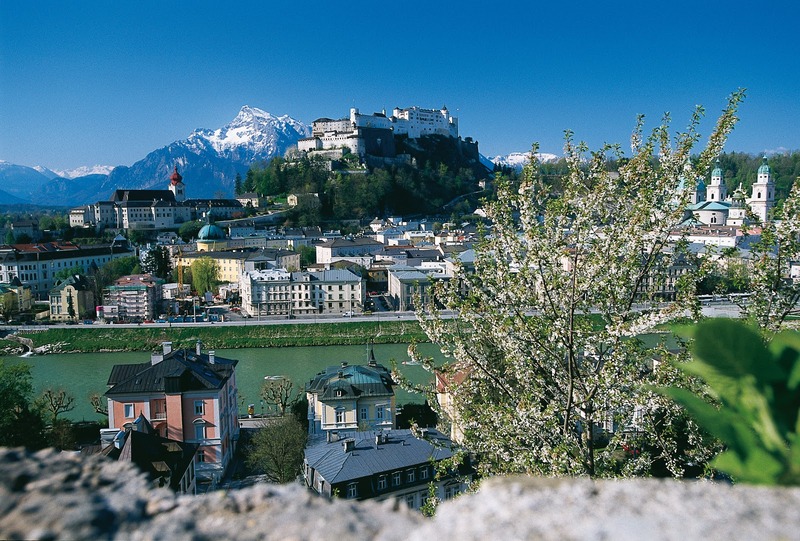 Photo: © Tourismus-Salzburg GmbH. 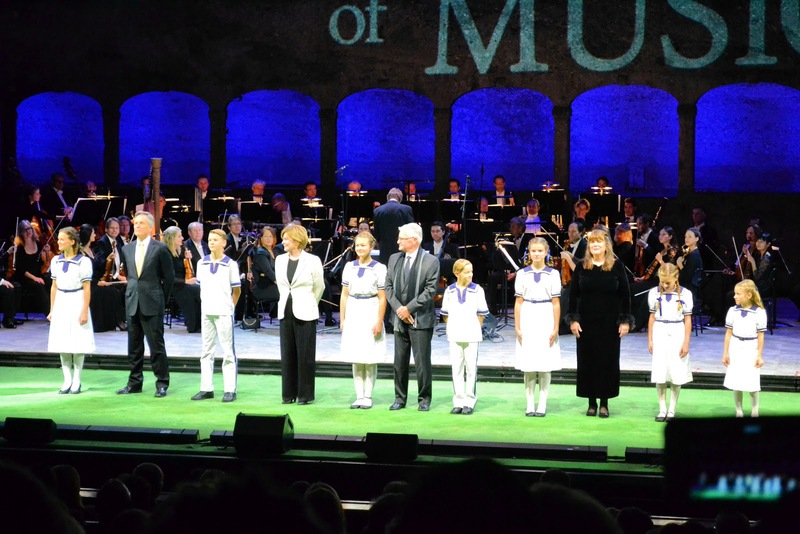 "Roll Call"—when Baron von Trapp (Kröger) summoned the kids to introduce Fräulein Maria, four of the original cast of kids joined the line-up followed by thunderous applause! 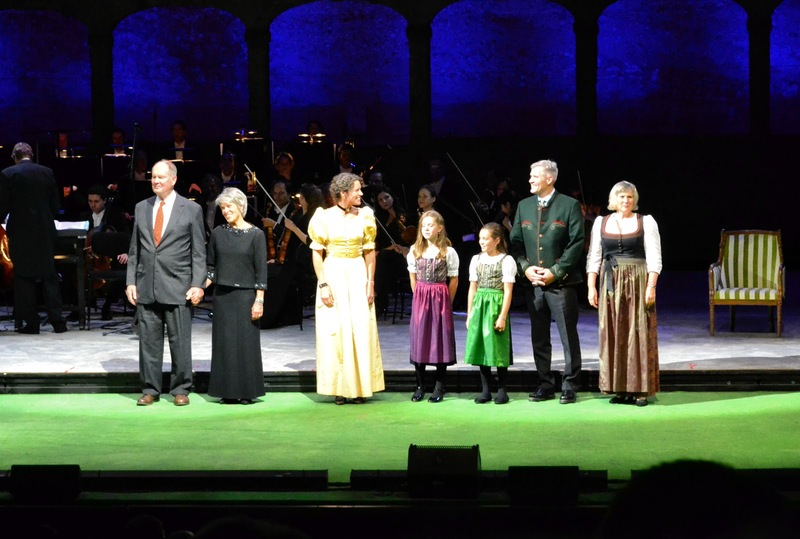 Johannes von Trapp, the youngest of the Baron and Maria's 10 children was joined on stage by his wife Lynne, daughter Kristina with husband and children, and Elisabeth von Trapp. 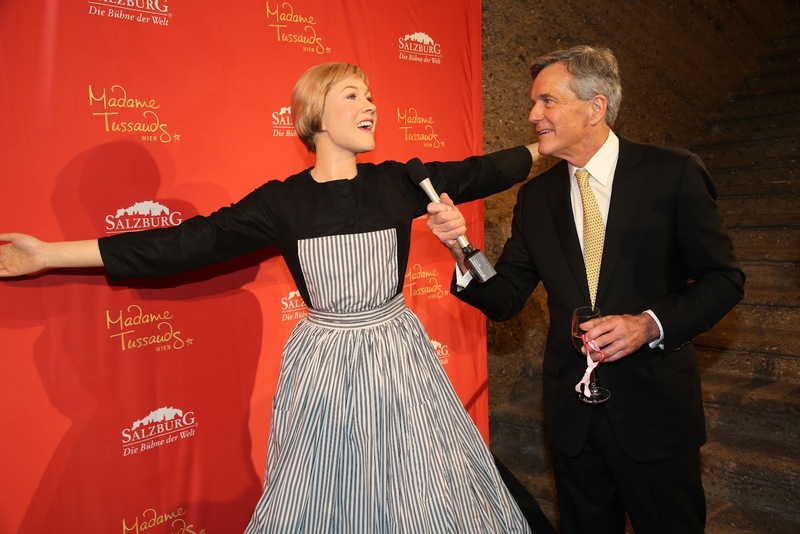 The unveiling of the latest star to take the stage at Madame Tussauds, Julie Andrews. The Mozarteum Orchestra performing the musical score. A candlelight procession of 50 nuns entered the theater on three tiers of arcades at the beginning of the show. During a reprise of "Edelweiss," the entire theatre harmonized and became one heavenly choir—a powerfully moving moment. 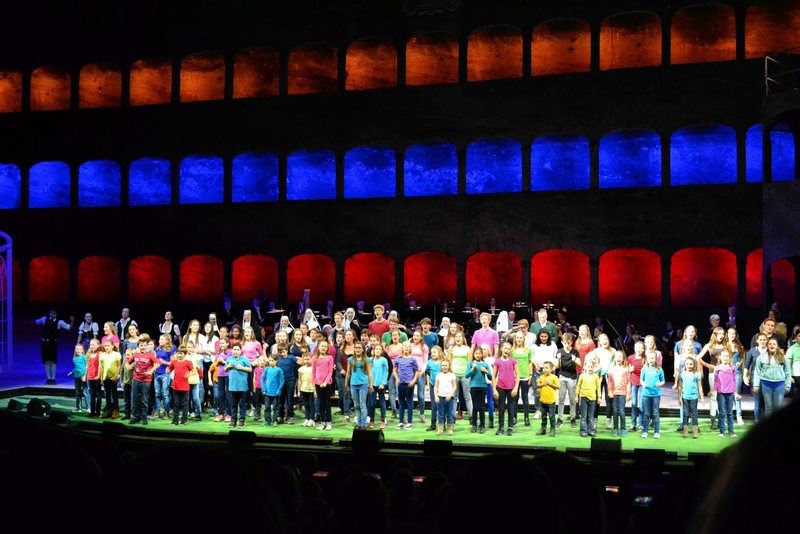 150 children who previously tried out for the gala returned to perform in the finale singing "Do-Re-Mi"! Surprise guests joined the lineup during the Captain's roll call. The audience erupted in applause. Meet the Von Trapps: (L to R) Johannes von Trapp with his wife Lynne, daughter Kristina with children and husband, and Elisabeth von Trapp who sang for us earlier that day. As each one of my favorite things came to pass, my emotions were running at an all-time high, by the time the grand finale hit the stage with theatre cast, the Von Trapp family, the original movie cast plus 150 children all singing "Do-Re-Mi," I was so choked up, I couldn't speak. Tears welled up inside over this incredible night filled with one unforgettable moment after another. I thought to myself, this will never happen again and realized how fortunate I was to be a part of it all. Truly this was a once-in-a-lifetime experience not only for me but for all those in attendance. I'll never forget it! One of the highlights of the night was when 150 children, who previously auditioned for the gala, returned to perform in the finale "Do-Re-Mi"! Although the 50th Anniversary celebration has ended, the legacy of "The Sound of Music" lives on. Original Sound of Music Tour is very similar to the tour I described above except for the Sound of Music Trail which is not included. 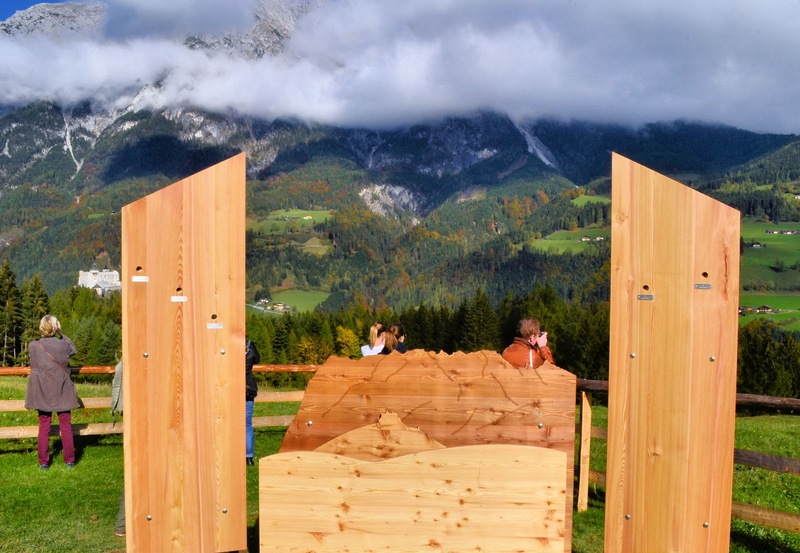 It's four hours in length and will take you through Salzburg and Salzburgerland. Two tours depart every day of the year at 9:15 a.m. and 2 p.m. 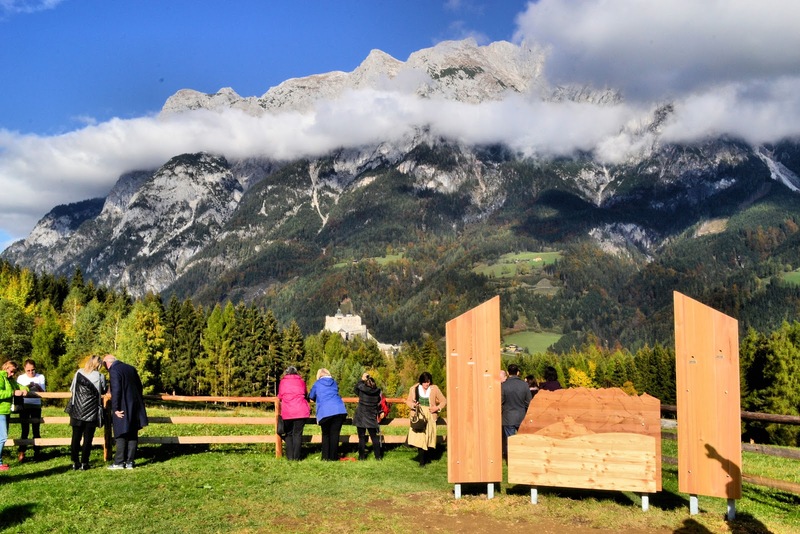 Private Sound of Music Tour offers nine hours of Sound of Music sights and includes breakfast at Leopoldskron Castle and a visit to the Sound of Music Trail. Although it's expensive for two, it would a great option for groups of five or six. More tours in and around Salzburg can be found at PanoramaTours.com. Saint Peter's Cemetery in Salzburg was used as the location where the Von Trapp family hid from the Nazis in the Abbey's cemetery. St. Peter's Cemetery served as the perfect hiding spot for the Von Trapps when they hid from the Nazis in the Abbey. Marionette Theatre whose interior served during the production of the "Lonely Goat Herder." The exquisitely manicured Mirabelle Gardens served as the backdrop for some of the "Do-Re-Mi" sequences. Nearby Schloss Arenberg is currently hosting an "on-location behind-the-scenes look at the Sound of Music" photographic exhibition by photographer Erich Lessing. The exhibition is on loan from the Leica Galerie Salzburg until April 30, 2016. Visit Salzburg Tourism for more information. 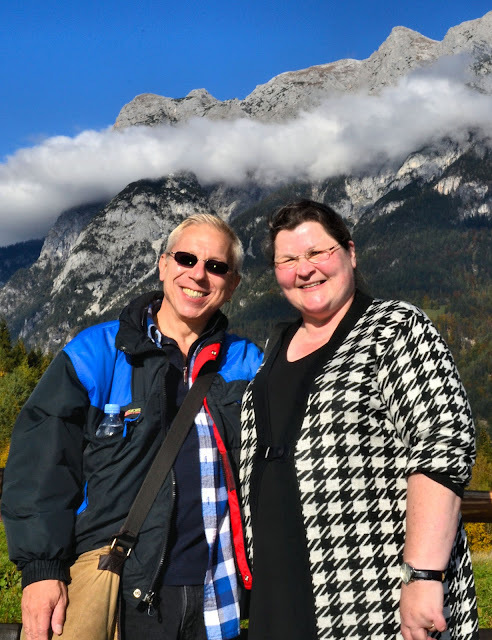 Our Sound of Music pilgrimage has ended for now, but I hope you have enjoyed this tour and delighted in some of the stories, images and videos too! Funny, it's been more than a week since my return but the sights and sounds of music endure in my sweet memories of Salzburg and Austria. Adieu, adieu, to you, and you,and you! Pictured here with my virtual friend whom I finally had the chance to meet face to face on this trip - Monika of TravelWorldOnline.de. Truly, she was one of the highlights of my journey to Salzburg, Austria! 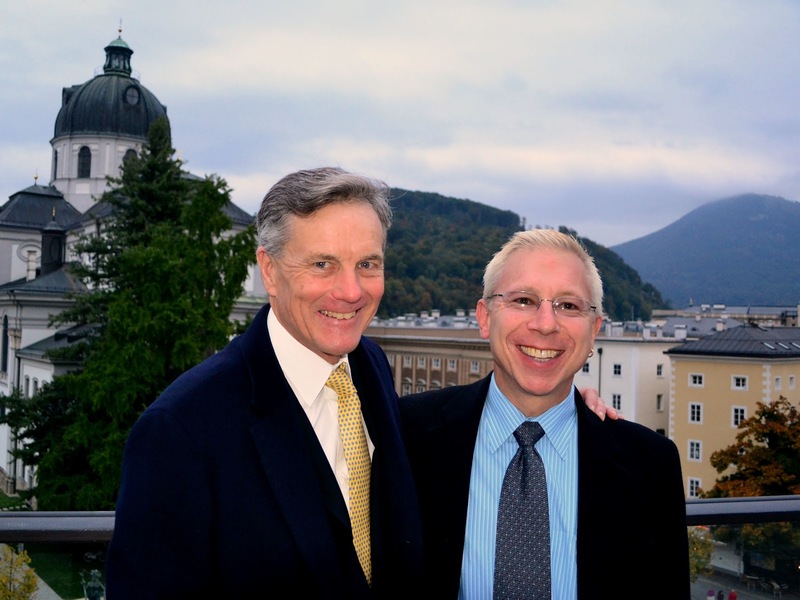 Special thanks to the Austrian Tourism Board, Tourismus Salzburg and Salzburgerland Tourismus for this once-in-a-lifetime special invitation to celebrate the 50th anniversary of "The Sound of Music." Of course, all opinions are my own however, unforgettable memories can be yours as well. Love it, Jeff! Haven't seen the Sound of Music in ages - digging out the DVD right now. This trip sounds fantastic! Hi there Sophie! Thanks so much for your kind words!! It was such a fascinating experience to see the sights come to life from the movie. The best part is that this tour is available to everyone who dreams of visiting the filming locations for the Sound of Music! Thank you for stopping by and sharing your thoughts! Loved being on location with you in this wonderful article. I'd love to do a Sound of Music tour and it looks like you really had a unique experience! I've been to Salzburg and fell in love with it. You've inspired me to return for more. Thank you so much Cathy! 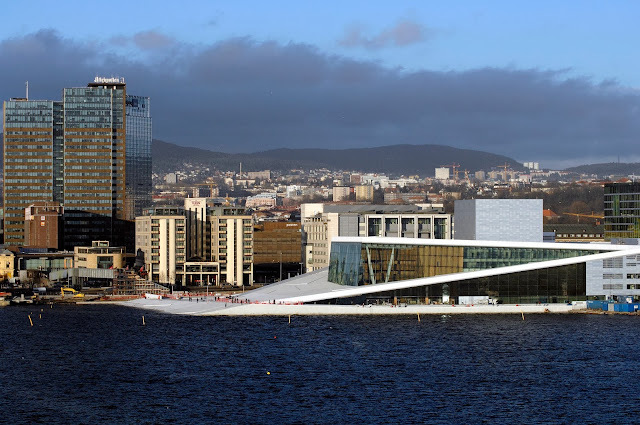 WHEN you return, you must take one of these tours, they're wonderful! And since you plan to return, my work is done. ;) Thanks so much for stopping by and sharing your thoughts! What a dream trip come true, Jeff! I saw the Sound of Music as a kid and Edelweiss has always been my favorite song from the movie. How wonderful it must have been to have heard it sung live, in Austria! 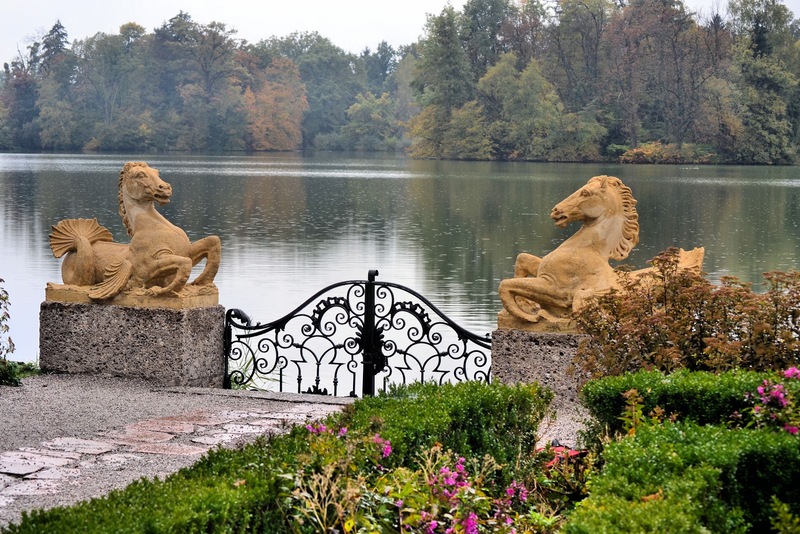 The photos are so much fun, love the kids in their costumes, and that gorgeous gate with the stone sea-horses. Austria is so beautiful! I couldn't agree with you more Lesley, it really was. On my first visit to Salzburg, it was during Christmas and only saw some of the sights made famous by the film but this trip was an immersion into all things Sound of Music, especially the last night, The Gala! Super fabulous!! Thanks so much for stopping by and sharing your thoughts! At the press conference you were on the right side, 3rd row from the back on an aisle seat. I guess you won't get off a bus again just to take a few more photos. Greetings my Anonymous friend! I sure do remember you, it's been a few years I think since you last wrote a comment. I am thrilled to have you back! You have a very keen eye to spot me among all those people, A++ for sure! Thank you so much for stopping by and sharing your comments! I find the mix of travel and music most charming! I visited Salzburg a few times in my life, I even know some musicians who participate in the festival every year but I have never participated any music festival in this city. This is something I really need to work one! Thanks for the encouragement! Hi Agata and thank you so much for stopping by! Well then, my work is done! ;) Yes, you must attend at least one music festival, performance, concert, etc. the next time you visit Salzburg! It's wonderful! So first, Jeff, the Sound of Music is one of my favorite movies. Second, I'm reading this and I found it difficult to readjust to my own reality, in other words, I was transported to Austria. I was right there with you, hearing the music, living your experience. Hi Marcia! I am so happy to hear that it's one of your fav movies, as you can probably tell, it's one of mine as well! ;) Thank you so much for your kind words and compliments. You've hit the nail on the head as it is my aim to invite the reader to experience with the journey with me and your praise honors me tremendously! My job is done! Please let me know when you plan to visit and I will help you every step of the way! Thank you again for stopping by and sharing your thoughts! You made my day! Great photos Jeff! I particularly like the way you captured the gates that is an awesome view. I had to go searching for the Sound of Music movie. It is now one of my favorite. In a nutshell how can you describe Salzburg and Austria? Hi there my friend and thanks so much for your comments. To answer you question how I describe Salzgurg and Austria? I thought I did that above. If you crave more, check out my other Austria articles. You can access in right margin above under destinations. Thanks for stopping by! It is a wonderful article with amazing picture of Austria. I've never been there but your post encourage to visit there. Thank you so much for fantastic article and keep posting fabulous articles like this. Hi there Jonathan and thank you so much for you kind words and compliments. They certainly go a long way with me!! And I hope you visit someday soon! !